Aluminum has long been TEAM’s metal of choice for innumerable applications because it combines functionality and cost-effectiveness with innovative form and design potential. Rather than outsourcing the ever-increasing numbers of aluminum die castings and risking unpredictable quality and/or consequences, TEAM Industries has its own foundry and aluminum die casting facility. This gives TEAM and our customers maximum product and quality control from design to delivery. TEAM’s state-of-the-art aluminum die casting equipment and technology, combined with our experienced foundry staff and full in-house metallurgical lab, ensure consistent castings of exceptional quality. Part sizes from 15-325 sq. in. 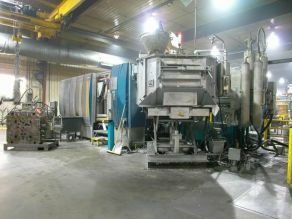 For a more detailed and facility-specific listing of TEAM’s die casting resources, see TEAM Detroit Lakes.